I've quit wondering why people would harm innocent people just because they think they own the truth. They simply do and always will. I happen to have very good friends in Boston - and incidentally will be there in 2 days - and I feel close to this - usually - very peaceful city. I just wanted to pay it and its inhabitants a small tribute by posting a photo of the latest Paris Marathon. We must keep running in the marathon of life. "We must keep running in the marathon of life." true! Thank you, Eric. Your tribute means a lot. I'm sure your kind words are much appreciated, Eric. You'll find a somber but still strong Boston when you get there. Stay safe and let me know if you find yourself in NYC. Very fitting tribute. I hope your trip to Boston is safe and enjoyable. Merci, mon ami. I don't know why anyone would do this, but your words are apt: "I've quit wondering why people would harm innocent people just because they think they own the truth." My friend ran that marathon and finished fast, before the bombs went off. I'm so thrilled he missed that, and so sorry for those who didn't. Wow you knew someone in among the racers?! that must have been frightening. I recall once again the day after 9/11/11, when the chairman of a committee where I worked wanted to cancel the evening meeting. I said terrorists want to disrupt our life. Keep living our life, don't stop. If we stop and hide because of them, they win. We had the meeting. Your tribute is nicely done. Merci. I really agree with that "If we stop and hide because of them, they win". Oops. 9/11/01 is what I meant. Thank you for your thoughtful post. 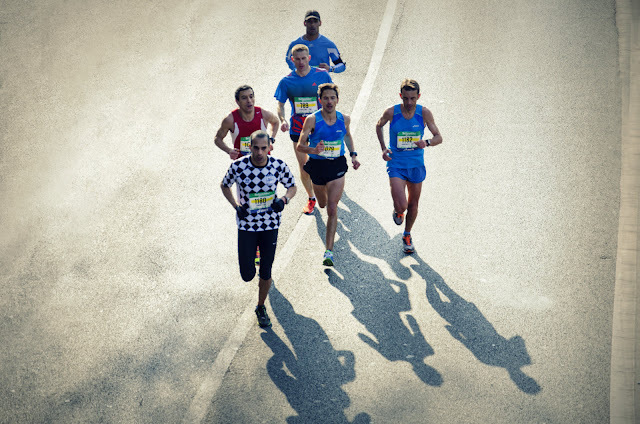 Like music, marathons represent a special kind of solidarity. Like air travel . . . hosting, participating in or watching a running event just got a whole lot more complicated and less enjoyable. True, but there is not much to do about that. Thank you for your lovely sentiments and all of your Paris pics. Your blog is a sanctuary for me. Let's all pray for the people in Boston. Thank you Eric, for this lovely post. Have a wonderful trip to Boston. Thank you for this post--some friends of ours were two blocks away when the explosions happened. Enjoy your time in Boston! This is a fine tribute photo, Eric. The people of Boston are tough. They won't let this set them back. I predict that next year more than 50,000 people will apply to run in the race.